People still say to me that the UK or the US had to embark on austerity, because otherwise the markets would have taken fright at the ‘simply huge’ budget deficit. How do they know this? Because people ‘close to the market’ keep telling them so. What can I do to show that this is wrong? The most obvious point is that interest rates on UK or US government debt have been falling since 2008, but the response I sometimes get is that rates have only stayed low because of austerity policies. So how about looking at one very short period, around the UK general election of 2010. The election itself was on 6th May, but Gordon Brown only resigned on 10th May, and the coalition agreement was published on 12th May. Labour were proposing a more gradual reduction in the deficit than the Conservatives, but the Liberal Democrats (the eventual coalition partners) were during the election closer to Labour. So if there was any default premium implicit in yields on UK government debt, it should have fallen between 5th May and 13th May, either because Labour were defeated, or because the LibDems capitulated on the deficit. Now you may say that the markets were anticipating a Conservative victory, but even if that is true, on 5th May there was some doubt about that, which should have been reflected in the price. The coalition agreement published on 12th May clearly states a commitment to “a significantly accelerated reduction in the structural deficit”, so that doubt should have disappeared by then. If there was a default premium in rates before 6th May, it should have fallen by 13th May. 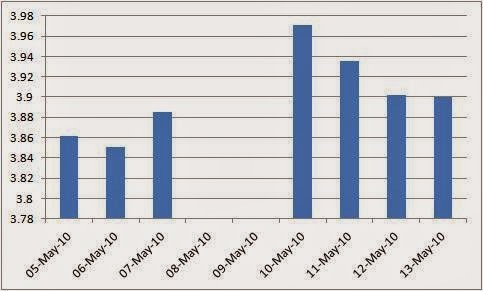 As you can see, rates were higher on 13th May compared to 5th May. More to the point, there was no noticeable decline in rates because fiscal consolidation was going to be greater. Now of course other things may have happened over these few days to offset any default premium effect, and you can always spin stories about how markets were concerned about a coalition government so maybe the accelerated deficit reduction was not going to happen, etc. But they are stories: in terms of the data, there is no obvious effect. The more sophisticated defence of austerity, as here from the Permanent Secretary at the UK Treasury in reviewing William Keegan’s new book, is that there exists a ‘tipping point’ somewhere: some level of the deficit at which the markets will take fright. It is then suggested, with reference to the Eurozone crisis, once you reach that point it is very hard to return, because a vicious circle sets in. Interest rates rise, making any new debt more expensive to service, which raises the deficit itself, making default even more likely. As we do not know where that tipping point is, it is best to stay well away from it by taking precautionary action before it is reached. The problem with this argument is that having your own central bank makes a key difference, not just to the chance of a funding crisis, but to its dynamics as well. Having your own central bank does not rule out the possibility of default. As Corsetti and Dedola explain, the costs of inflation created by monetising the debt may exceed the costs of default. Markets know that, so they may still at some point begin to suspect that default could happen. It therefore follows that the markets could get it wrong: they may begin to suspect default even when there is absolutely no intention within government to let this happen. Having your own central bank, which is already undertaking Quantitative Easing, does not just make a funding crisis a lot less likely, it also crucially changes the dynamics. If a crisis occurs, the government is not trapped in a vicious circle. This in turn means that there is no obvious reason to act in a precautionary way. So why did no one make this point nearer the time? The answer of course is that they did. If you think that in these circumstances a foreign exchange crisis will get you, you need to explain why Paul Krugman’s analysis is wrong. I agree. And taking your point even further, it would be easy to make the entire national debt vanish in a puff of smoke: just QE the entire lot. Though it would doubtless be less disruptive to QE the debt as it matured, rather than QE the entire lot in one go. Obviously some sort of countervailing and deflationary measure would be needed to deal with the stimulatory effect of that mega QE operation. But that’s easily done in principle: raise taxes. There is however a problem for you here, namely that disposing of all state issued interest yielding liabilities implies making zero interest a permanent feature. That clashes with your claim that interest rate adjustments rather than fiscal adjustments are best in normal times. However, Milton Friedman and Warren Mosler advocate/d a permanent zero rate and I agree with them. Since this blog is for amateur as well as professional economists, I want to hear a plain English explanation from you as to what’s so wonderful about interest rate adjustments. The empirical evidence, far as I’m aware, is that they don’t work too well. Plus they are distortionary in that they adjust ONLY lending based activity, and not non-lending based activity. I support your request for more detailed, plain explanation of wonderfullness of interest rate adjustment. But what is not lending based activity, there is almost none left? Jure Jordan, To be more accurate, its households and firms not reliant on SHORT TERM debt that are not much influenced by base rate changes. That’s households with no mortgage or only a small one, and firms which are funded mainly or exclusively by equity and long term bonds. Now people need to look at how the mechanism works when the CB's purchases of bonds, they begin to reach redemption point, and they do not chose to use the proceeds to purchase similar assets. If it the purchase of govt bonds the original purchases draws money from the economy but it goes back that period to govt payees, in this way when borrowing almost idle cash in the hands of the original purchaser and turnstiling it out to contractors, suppliers, pensioners, for medical service provision, and to employees) - so it stimulates the economy. How does it work, however, when the CB choses redemption without new debt-purchases, and it ends up with millions/billions of cash on the CBs books? Chair Yellen mentioned $800 Billion is being retired in the coming period (her press conference this week). In the US it may be that the redeemed 'money' just gets transferred to the Treasury (so they do not have to sell bond if they just do an accounting offset) - making it helicoptered money when the govt payees get the money. Not sure how this works in the US,; how does this work in the UK?? And what influence does this aspect of QE do for the economy (it certainly pumps in more created-money via govt payees).?? I actually think QE is deflationary. The govt won't be making interest payments. The one point in the Treasury review which I haven't seen disputed - though it may well be debatable - is that given the notorious 'stickyness' of the UK productive sector, a significant fiscal stimulus, and increase in deficit, in 2010-2011 would have led to a massive increase in imports. I have my suspicions that there are ways of managing a fiscal deficit that will minimise the propensity to import but these have never been tried as they might distort markets. Incidentally, I think you, Krugman and others have occasionally mentioned - but only in passing - that 'distorting markets' is not a serious policy criticism at times when the markets - for debt, labour, capital - are clearly not working. But I have yet to see this critique properly worked out. A job for a neo-Marxist economist perhaps, if any survive. "Having your own central bank does not rule out the possibility of default." No it doesn't but it makes it extremely unlikely. To add: Having your own and independent of foreign debt (exchange rate) central bank does not rule out possibility of default but it makes it extremely unlikely. But what countries have such 'luck' to have their own independent central bank? Only former British Comonwealth countries plus Japan and Switzerland. Those are former and present empires plus a country where they hide their money. So, are they really "former" or still full blown empires and other contries are colonies and colonies of other colonies? Only other countries that can avoid raising interest rates in recessions are export led countries. They have no independent central banks, even tough CB is their own, they have to raise interest rates to raise foreign funds in recession and banks follow that and raise interest rates for those countries and their population. Every central bank controls interest rates for their own country: What rates CB demands from banks, they in turn demand same rates from state and people. So, every CB controls interest rates for their state. Why they raise rates in recession is other story. When you come out with the truth about what fund is the source for government borrowing i believe that you will be much more convincing about why government debt will not be more costly and why it will not default. Financiers themselves know that, but economists avoid it. Economists are not allowed to talk about money, banks and debt. Bank reserves are the source fund for public debt. This is the most important source. Also the willingness of other countries to grab your money - desperation of those countries that do not know how to sell to their own people but to you: to UK, USA, EU, Japan, AUS. But trade generated debt is less important then debts to domestic banks (only for former empires). What creates bank reserves? : Public spending and people's savings/ deposits. Taxation destroys reserves while spending increases it. So deficit spending is net increase of bank reserves which then states borrows for that deficit spending. It is circular, isn't it? Government deficit is the source fund for itself. So why would interest rate increase if it is covered by its own existence? On the other side, credit defaults and deleverage can reduce bank reserves but QE solved such problem. Government deficit is the source fund for itself. It is surprising just how much this spurious narrative of the Hellenisation of the UK economy has been resisted by the UK population, given that their politicians have either supported it or been silent on the issue, the press has mostly been behind it, the BBC has promoted it relentlessly, the LibDems have imported it from the worst of the Eurozone thinkers. You would think, after all this, the Tories of today would have the level of support they gained during the 1930s. The title of this post should have been "Five days in May"
From a US perspective, I wouldn't mind a little jitters in the markets. The dollar is way too strong. I think someone like SRW should study the impact of globalization on wage price stickiness and inflation. As for US eqities, the markets seem terrified of Fed hike in June maybe, which would be very bad for me and those holding equities. As Krugman wrote, in this situation wait until you see the whites of iflation's eyes. It is disingenuous, to say the least that there was no panic in UK financial markets. True, there was a historic fall in Gilt yields after the collapse of Lehman. mostly attributable to the lack of confidence in the banking system at the time but the sense of panic was pretty obvious in the currency markets. Panic over deficits? Where is your evidence. A surprisingly temperate comment on the Permanent Secretary at the UK Treasury's review (of William Keegan’s new book). His views are pretty exactly those of the German government, which you, not so long ago, attributed to "greed or ignorance". Now they are only a "more sophisticated defence of austerity". Have you changed your mind? Or are you simply being patriotic or afraid of the libel laws? As I'm sure you will remember, the "greed or ignorance" quote came from trying to understand why Germany appears to want its inflation rate to remain at or below 2%, thereby - given the competitive advantage that it gained before 2007 - condemning the rest of the zone to something like deflation. The "greed" was that this was a deliberate attempt to avoid the consequences of their earlier undercutting of other zone members, while the "ignorance" was that they just did not (and still do not) realise what the impact of fiscal austerity at the ZLB would be. If you can show me evidence that the German government's view is more sophisticated than this, I would be very pleased to see it. I am being entirely honest here - I really would like to see a good defence of their position. Ah, now you are your old self again and have given an excellent summary of your opinions. The only thing missing is your comment on Tsipras and Varoufakis. But you did not respond to my second paragraph. Such a document may not exist, but I would like to see it if it does. The Tories at home, the Germans in Europe - terrible, simply terrible. And especially terrible for someone who is in possession of the truth and does not find belief. And the infidels even doubt his common sense. A pity. Admittedly there were plenty of reasons for panic in the autumn of 2008. Alastair Darling made clear in the autumn statement of November 24th how serious was the deterioration in the public finances. "Because of the scale of these global problems, it is inevitable that tax revenues will take some years to come back up. That all means that borrowing will be significantly higher than forecast......the economic crisis and the action by Governments across the world inevitably mean sharp increases in national debt relative to GDP—we will be no exception"
There followed an unprecedented decline in the sterling exchange rate index from above 84 in November 2008 to 74 by the end of the year. But this reflected a global financial crisis where the UK was particularly vulnerable. Have a look at the exchange rate over the same period as above. If you are right, we should see an appreciation over those few days. We don't. Where do you find Sir Nicholas Macpherson's awareness of the misery imposed by austerity in his review of William Keegan's book? As for Germany's undercutting the European periphery, it simply followed the Euro rules: If you don't have a currency of your own nor a central bank that can regulate interestrate in your economy's interest, the only way of reacting to 5 million unemployed is internal devaluation - that is a fact you have often pointed out . And it was so evident that the unions in Germany agreed to it without government pressure, esp. since it was done in a very mild way: not lowering wages but only restraining rises. Why didn't they think of those things in the periphery? As far as inflation is concerned, that is a matter of the EC,. who is trying hard. It seems to me that Germany followed the rules and yet must suffer your moral condemnation. Odd. 1% inflation then means 3% inflation now in Germany, if the ECB was able to do its job. But the ECB is not able to do its job because of austerity encouraged/imposed by Germany. Is that because Germany does not realise what austerity is doing, or because it does not want the ECB to hit its target because it would mean 3% inflation in Germany? Ignorance or greed? And you prefer not to answer my first question. - or is totally unaware of what austerity is doing in spite of the fact that the papers are full of it. The history of countries and firms shows that, as a rule, reforms are only undertaken under the pressure of crises and that politicians usually prefer the path of least resistance (when Schröder dared to do it differently, it cost him the chancellorship). A current example: The purportedly leftist Syriza government has just given Greece's richest tax evaders a break of no less than 50 % and allows them to pay the rest in up to 100 monthly instalments (eight years!). So it is plausible that pressure has to be maintained if we do not want to change the periphery into a European mezzogiorno - a bottomless pit of lost money. Germans are especially aware of this problem since they poured more than a trillion Euros into East Germany. Furthermore, Germany has more to win than lose if all European countries are prosperous. That is what the German government has been saying all the time. What reason is there to disbelieve them? So you are saying that in order to get other countries to enact various reforms, Germany is ensuring that unemployment in these countries remains high. For reforms, all it takes are a couple of sensible acts of parliament. But if the governments and parliaments do not introduce and pass those acts, it is they who are keeping unemployment in their countries high. What are your proposals for Greece? Jacob Funk Kirkegaard of the Europe-friendly Peterson Institute is supposed to have said that Greece's resistance to reforms is on a level with that of Zimbabwe or Pakistan. How would you persuade the Greeks to do something sensible? Since when has it been acceptable for one country to use its economic position to tell other countries what legislation it should pass in their parliaments, and to create large scale unemployment as part of the process? The Greeks want money. Germany does not owe them anything. Yet it will help the Greeks if they comply with certain conditions. What's wrong with that? That is what banks say when deciding to give credit. If your bank is different, please give me its name - I'm highly interested. By the way, I did not say Greece has done nothing - just that it is not enough (see their new tax law). What happens instead is that the occasional bit of academic work that is supportive of austerity (and the great majority is not) tends to get a great deal of prominence in the media and by politicians. Yes, sorry, I didn't properly quantify 'professional economists' (and as you realised, I meant academic rather than professional). Also, it's not clear to me what, if any, mechanism R&R envisaged as mediating a causal link between high debt and low growth, but I'm guessing the confidence fairies must come into it at some point. I think their work was essentially empirical. But there are good reasons for thinking that high levels of debt might reduce GDP in the long term, by crowding out private capital and increasing distortionary taxation. What is less clear is why these effects should be quite as non-linear as the R&R results suggested. Per the link above, it seems their findings are primarily of sociological rather than economic interest. "The nonlinear effect of debt on growth is reminiscent of “debt intolerance” (Reinhart, Rogoff, and Miguel A. Savastano 2003) and presumably is related to a nonlinear response of market interest rates as countries reach debt tolerance limits." "Labour were proposing a more gradual reduction in the deficit than the Conservatives..."
This is pretty good evidence that macroeconomists do no understand how the markets functions (and so perhaps should be a little more modest in their claims about how markets will react). The markets do not care about what Labour proposes; it cares about what Labour was going to do once elected. And everyone I knew believed that Brown was lying through his teeth and was going to do exactly what the Tories wanted to do, but only admit it after the election. I had not thought of that explanation, perhaps because it is absurd. It is also a bit rich to accuse me of immodesty, when the other side is claiming we have to have austerity because they know what markets will do without it. It's not at all absurd. If you think it is, then you do not understand how markets work. It is very very difficult to divine why markets did what they did. The austerians do not BTW have to assert what markets will do - I don't think many did. They have only to assert there is a greater risk that markets will do something. Since this is difficult to quantify and verify (how would you measure this risk? ), we enter metaphysics and leave science behind. So I don't think either the austerians, or the Keynesians, when making assertions on this topic are scientists. Interestingly, everyone I knew believed that Brown was being honest and was going to do exactly what he proposed once elected. - Given the beliefs of those you know, and those who I know, well...who's right? This fallacy of an 'appeal to belief' of course is no argument at all, and is absurd as the rest of your argument - which is mostly logically incoherent as SWL has already pointed out. @Simon. Exactly. You do understand you're supporting my point? It's not what Labour says it's going to do which matters, but what people believe Labour is going to do. SWL's claim that Labour proposed this, therefore it should have such-and-such impact on the market, is wrong. Absolutely wrong. Worse than wrong, it's rubbish. What matters is what people believe what Labour is going to do. He has provided no evidence about what people believed. So he can draw no inferences based on how the market behaved. None. Zippo. You do understand that the point you are making completely undermines the austerity case. That case depended on the view that the markets required action now to reduce the deficit. There is no evidence from prices that there was any concern. There is no evidence from thinking about the basic economics of default. The only evidence was from people 'close to the market'. But you have produced no evidence about what market participants actually believed. None. Zippo. No, Anon, far from it. I'm very clearly illustrating the incorrectness and the (now continued) incoherence of your point, mainly by your ridiculous use of a fallacy to 'support' your argument. I notice you didn't address that - which was the main point of my reply, but instead chose to deviate and turn logic on its head by misrepresenting the point I raised. You assert that the market cares about what labour would actually do once elected, then used a fallacy (appeal to belief and popularity..."everyone I know...") to present a position of the markets views - which was not supported by any evidence at all (eg. reflected in prices as SWL notes above). You criticise SWL for having "no evidence about what people believed", when you have none either - despite the pathetic attempt of trying to fabricate some in saying "everyone I knew believed that Brown was lying through his teeth...". Unless of course 'everyone you knew' was a truly representative sample of the market...and you do of course have evidence to show this? Or is it None, Zippo on that front? You may disagree with SWL, which is fine. But try to offer logically coherent, fallacy-free arguments when you do so, without the desperate attempts of mis-representing others. @SWL. But I'm not trying to provide evidence supporting the austerity case. I'm refuting your naive (and absurd) view of the markets, which seems to be, if a politician says something, the markets must believe it, and therefore it should impact prices in a certain way. Wrong. @Simon. Well, I did provide evidence, you just don't believe it. That's not my problem. I think there are rather better reasons for thinking that under Brown we would have had less austerity than just what he said. Anon: Again, an unsubstantiated claim of "everyone I know..." isn't evidence, even if I was to believe you, since 'everyone you know' isn't large enough to be representative of the market. Saying something which you have no proof for can't be taken as evidence (in this case at least), as I demonstrated before when writing "everyone I knew believed that Brown was being honest and was going to do exactly what he proposed once elected." Everyone is entitled to have their opinion on what Labour might or might not have done, but it remains just an opinion and not evidence, unless you have some other proof to show Labour were going to do the same as the Tories. @SWL. "I think there are rather better reasons for thinking that under Brown we would have had less austerity than just what he said." Well then that's what you had to argue. Again, what is important is not what Labour says it will do, but what markets think Labour would do. The difference is important. And the argument as to what the markets really believed is very, very difficult to make. You might use price information to determine these beliefs, but if you do this then you can't draw any non-trivial inferences about the prices from the beliefs (as you are trying to do). Another way is anecdotal, and normally you should be as well positioned as many, since at High Table you would have been able to occasionally to talk to alums who are visiting who work in the City. (Even that is not foolproof, because you can't necessarily take what anyone says at face value either, but anyway it's pretty much the best we have. Alums at high table are not talking their book at least, although if they think you are influential, they may be slanting their discourse to manipulate you in some way.) My impression however on reading your blog is either that Magdalene doesn't have many of these alums, or you steer clear of them when they do come back. My recollection - my access in from an entirely different direction - is that the markets thought Brown was liying through his teeth, and was doing a classic, "Spend a lot of money before the election in order to get voted in, then make a U-Turn and turn off the spigot right after." While they expected a different mix of how the deficit was going to be closed (taxes/spending, and where the spending cuts were going to come from), they expected the same order of magnitude. Does anyone have Goldman Sachs reports emitted before the election? That might be the best indication still extant of what the markets believed, although again GS can be guilty of talking its book or manipulation. Bloody hell, give it a rest - you're really not making as radical or devastating objection as you seem to imagine, with all this stuff about 'not understanding how markets work' and 'descending into metaphysics'(!). It's like a drunk who repeats a joke because no-one laughed the first time. They heard you, they just weren't impressed. There was no good reason to think Brown was lying, and every reason to think that he intended to do approximately what he said he planned to. A rich and well-confirmed theory of Gordon Brown, which was widely understood, has him carrying out the plan if elected. He wasn't a big liar and there was no hint that the plan night have been a fake. The plan described exactly the kind of thing you would expect him to do, and there was no reason why he wouldn't be able to do it. So until you provide some basis for your theory that 'the market' thought, against all the evidence, that he would do a U-turn, that scenario is of no more interest than any other arbitrary and remote possibility. You do understand that the point you are making completely undermines the austerity case. That case depended on the view that the markets required action now to reduce the deficit. There is no evidence from prices that there was any concern. Why do central banks use New Keynesian models? Is the Walrasian Auctioneer microfounded?